A short update. We recently released details about Maxwell coming to mobile and desktop very soon. We also said that the mobility flagship 880M will remain a re brand while some of the lower models will be upgraded to Maxwell architecture. Well Nvidia has just more or less confirmed the first such chip. 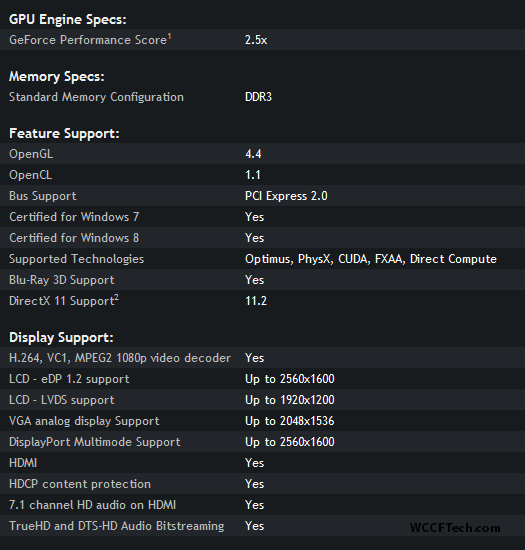 Nvidia Updates Specs Chart of G820M adding DX11.2, Maxwell GM117 GPU instead of GF117? As you can see DX 11 has been updated directly to DX 11.2. The Geforce 820M should feature the GF117 Core that is based on the Fermi Architecture, but if this is true then it means that it will have the GM117 Core instead. We have also received confirmation of the same from our friends over at Computerbase.de They also arrived at the same conclusion as us, that Nvidia has updated the 820M’s architecture from Fermi to Maxwell. Also the fact that Fermi GF117 was originally advertised at OpenGL 4.3 which is now OpenGL4.4 is a massive hint.